The Four Whitneys arrived in Jaipur, India late Friday night after a rather choppy flight from Singapore in an aircraft full of crying/screaming toddlers with mothers that were unfazed by it. 😒 I’m extetmely thankful for firefighter rated earplugs! Jaipur, the famous “Pink City” (for the color of the old city buildings), is the capital of the Rajasthan State. Yesterday we started our day visiting the Hawa Mahal, also known as Palace of Winds. Its most famous side is not the front but rather the back of it. This unique five story exterior looks like the honeycomb of a beehive with 953 small windows called jharokhas decorated with intricate latticework. was to allow the ladies of the royal household to observe everyday life and street festivals in the street below without being seen, since they had to obey strict “purdah” (face cover). Built in 1799 by Maharaja Sawai Pratap Singh, it’s design was drawn from the patterns in Lord Krishna’s crown. Chaotic, hectic but full of treasures, so far, India is exactly what I pictured in my head. Driving and walking through Jaipur is an explosion of colors, sounds, smells and sights. We visited the Jaipur Old City Palace and then we were off on the road to the town of Amer where we stopped at the Jal Mahal or Water Palace. Located in the middle of the Man Sagar Lake, the palace sure is eye popping. there was a natural depression where water used to accumulate. In the late 1500’s when there was a severe famine in this region there was consequent acute shortage of water, the then ruler of Amer was motivated to build a dam to store water. A dam was constructed and it was later converted into a stone masonry structure in the 17th century. The palace is a five story building out of which four floors remain under water when the lake is full and only the top floor is exposed making it impossible to visit. In the town of Amer, we visited both Amer Fort and Jaigarh Fort. Originally believed to have been built by Raja Man Singh during 967 AD Amer Fort, as it stands now, was built over the remnants of an earlier structure during the reign of Raja Man Singh, the Kachwaha King of Amer. It went through several renovations, additions and restorations throughout the years. Today, the 1000 year old Fort is a UNESCO World Heritage Site. You can either walk up to it or ride an elephant. Several groups have raised concerns regarding the abuse of these elephants and their trafficking and have highlighted what some consider the inhumane practice of riding elephants up to the Amer Palace complex. Above the Amer Fort, Jaigarh Fort stands tall on the upper hill. The fort, rugged and similar in structural design to the Amer Fort, has a length of 3 kilometres (1.9 mi) along the north–south direction and a width of 1 kilometre (0.62 mi). The fort features a cannon named “Jaivana”, which was manufactured in the fort precincts and was then the world’s largest cannon on wheels. Jaigarh Fort and Amber Fort are connected by subterranean passages (not open to visitors). Both feature a lot of Arabic features which reminded me of the fabulous forts we saw in Oman. So far so good. Now, we are going on a road trip to Agra. We’ll see what wonders we encounter on the road. We left Jaipur for our road trip with our driver Sushil (he drives like a madman btw…). Our first stop was in the town of Khanna-Balaji where we visited Galtaji Khole Ke Hanuman JI or Monkey Temple dedicated to Lord Hanuman. It has a series of temples built in to a narrow gorge where a natural spring flows down the hill through a small spout in the shape of a cow. Cows are sacred in India so the natural pools below or kunds are believed to be sacred since they come from this cow spout. It is believed that if you feed all the cows in the site ares well areas the hundreds of monkeys, it is good karma. So we bought a bag of garbanzos on the side of the road and we proceeded to go feed the monkeys. Lots of pilgrims were bathing in the sacred water. The monkeys are quite a show. They come to your extended hand full of garbanzos, they hold on to your pinky finger while they pick garbanzos one by one. They steal from each other, they chase each other and it’s just hilarious. The cows too are fed. One of them, the one wearing a scarf, became my friend and followed me to the car. Our second stop was in the town of Abhaneri where we visited Chand Baori, one of the oldest and certainly the biggest stepwell in India. Built by King Chanda between 800 and 900 AD, it was dedicated to Hashat Mata, Goddess of Joy and Happiness. As soon as we entered, Dante immediately said: “Oh, the Dark Knight Rises” (I don’t know how he remembers movies so well…) The stepwell has been featured in movies and many documentaries. It is magnificent to say the least. It is very very deep and a little scary… Good thing they don’t allow people to go down. Our third and last stop before arriving in Agra was in Fatehpur Sikri, a city founded in 1569 by the Mughal Emperor Akbar. It was the capital of the Mughal Empire. The complex is huge and it consists of a fortified palace and a magnificent mosque. Built with Sikri sandstone it mixes Hindu and Arabic architecture. This place is breathtaking! Another wonderful treasure. Fatehpur Sikri is a UNESCO World Heritage Site. After spending a lot time here, we finally arrived in Agra, a city that sadly, no one would visit if it wasn’t a the Taj Mahal. A town with many challenges and disadvantages. We are staying at the only Marriott and our car had to be checked by a bomb sniffing dog as well as our bags before even getting into the parking lot. Then before entering the lobby, a full X Ray scan of our bags and we went through metal detectors. I was escorted to a separate room so I could be patted down by a woman. Finally we are let in, in what really feels like another world. The hotel is luxurious, a mind boggling contrast to what’s outside. Sad, thought provoking…without words. The ivory-white marble mausoleum that Shah Jahangir commissioned almost 400 years ago to house the tomb of his 4th and favorite wife Mumtaz Mahal, needs no introduction. We’ve all seen it in pictures, movies, documentaries… we’ve all heard about it. One of the only drawbacks of traveling extensively is the ‘been there, done that’ monster that, as understandable as it is, I sure hope it never catches me. It did however show his ugly shadow today when we got up at 5 AM to go see the Taj Mahal at dawn. After seeing Sheikh Zayed Mosque in Abu Dhabi, in turn inspired by the very Taj, I was afraid the latter wouldn’t impress me to the point I expected. Very few places in the world have given me that breathtaking feeling that stops you in your tracks. Since we entered through the East Gate, it wasn’t until we turned the corner that it’s highest dome peeked above the outer rampart. And then you enter the first gate and it’s shape frames the entire Taj Mahal in the distance. That in itself is grand! But when you emerge from the gigantic gate you see it in all its splendor and beauty and it stops you in your tracks. It, unapologetically, reminds you that what stands the test of time and what is built with love and discipline will never ever disappoint you. We were lucky to be within the first 15-20 people to go in so we had a lot of spots all to ourselves. It was a very quiet visit. The Taj demands all your attention so there’s not much time for anything else. Any angle you see it from, any picture you take of it, will be perfect.The serenity of the grounds is a stark opposite of the chaos and hard-to-look-at city outside. After our long stay admiring her, we decided to take the rest of the day off and enjoy some pool time. I can’t get her out of my mind though… and I doubt I ever will. Yesterday we took the train to Delhi and today we went out to see a little bit of this huge and crowded city. We visited the Red Fort (UNESCO World Heritage Site), residence of the Mughal Emperors for 200 years from the 1600’s to the 1800’s. Built by no other than Shah Jahan, the same Emperor that built the Taj Mahal. Pretty talented dude! We later visited Agrasen ki Baoli, a +/- 700 year old stepwell in the middle of a now residential area close to the very center of New Delhi. The Baoli was full of water until the 1970’s (as seen in the b&w picture) but then it dried up and the Archeological Survey of India stepped in to restore it. This place is super cool! We ended our day at the India Gate, a memorial to soldiers of the Indian Army. The arch is reminiscent of the 1700 year old Arch of Constantine outside the Roman Colosseum or the 180 year old Arc de Triomphe in Paris. Old temples have the edge of time on their side. When you hear how many years old a temple is, somehow you respect it more the older they are. But sometimes we have to pay attention to what’s been built today, for in 1000 years, it will be an ancient archeological site as well. Such is the case for the massive Swaminarayan Akshardham, an out of this world Hindu temple complex that displays millennia of traditional Hindu and Indian culture, spirituality, and architecture, built from 2000 to 2005. The complex is only 12 years old but its granduer and beauty has earned it the Guinness World Record for the largest Hindu temple in India. It is entirely constructed from Rajasthani pink sandstone and Italian Carrara marble. Based on traditional Hindu architectural guidelines, it makes no use of ferrous metal so, it has no support from steel or concrete. Swaminarayan born in 1781, is the central figure in a modern branch of Hinduism known as Swaminarayan Hinduism. He is believed by followers as a manifestation of God. Very impressive building and complex with tons of security too. Apparently, other Akshardham temples have been the target of terrorist attacks so security is super tight. We were patted down thoroughly and you have to check in everything you’re carrying at the door. 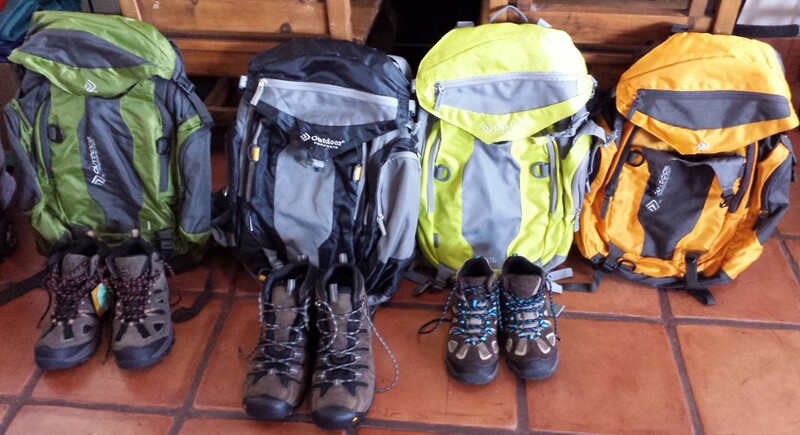 Tomorrow morning we’re off to Nepal. Previous Previous post: Singapore, Tiger Nation, Garden of the World. Next Next post: Magical, mystical Nepal and the Top of The World: Mount Everest.